Asheville, North Carolina is perhaps not the first place one would look for a band such as stephaniesĭd. A haven for artistic types of all sorts, this “Berkeley of the South” as it’s sometimes called – along with the more recent epithet “cesspool of sin” – welcomes and rewards creativity in all of its myriad guises. But when it comes to music, the prevailing local flavor tends toward bluegrass and old-time. (I should note than an intrepid publicist who’s also a keen student of such things assures me that these are, in fact, two distinct styles. Who knew?!) Progressive, original art-pop of the sort in which stephaniesĭd traffics is not something you’ll stumble across every day on a stroll down Lexington. Moreover, only a few local Asheville bands have managed to break out of the local scene into something higher-profile. Way-way-back in 1967, a band called the Ron-de-voos cut a single – now impossibly rare – called “Trip So Wild,” a spooky folk-psych number about a less-than-wonderful experience with LSD. A bit more recently, the ominously named (and endlessly hyped for no good reason I could discern) Drug Money teetered on the verge of a national breakout when personal problems of the you-can-probably-guess variety caused a failure to launch. There’s also the admittedly-great underground sensation Reigning Sound, led by Memphis transplant Greg Cartwright: this sort-of local band hasn’t made the big-big time (yet), though they certainly deserve to. I saw them again a couple years later – let’s say 2008 – and it was a completely different experience. Yes, Morgan and husband (ace keyboardist Chuck Lichtenberger) were still out front, but I think that some of the other personnel had changed. In any event, the sonic flavor and visual aesthetic were completely different: more feather boas, a bit funkier, a bit jammier, and – for me at least – a bit less impressive. And certainly less possessed of a distinctive character. Maybe it was just an off day (for them, or for me). Fast forward to 2011, and the release of Starfruit. This long-player is the group’s fourth since 2004, and it’s impressive enough to nearly wipe away all of my previous impressions of the group, good and not-so-good. I can only guess that the band has been paying its dues these last few years, honing its craft in the process. Imagine a bunch of players with the chops to play jazz, but with a healthy appreciation for the pop song format. That’s as succinct as any description of the band and its ethos. Taut, expert playing that doesn’t betray a hey-look-at-me attitude: that’s a hallmark of the songs on Starfruit. The disc opens with “Closer,” a number that evokes Eurhythmics crossed with a modern trip-hop vibe. Subtle flourishes and vocal countermelody crosstalk give way to a brief saloon-jazz piano figure. Put another way, there’s a lot going on, but all of it moves the song forward. Morgan’s overdubbed vocal acrobatics kick off “Life of Pi,” a tune that quickly moves into a south-of-the-border (soca? I’m not sure) aesthetic. Morgan’s voice – admittedly not for all tastes, but I dig it – is used within the context of stephaniesĭd as an actual instrument at least as often as a lyric delivery device. In fact, with no disrespect to the lyrics (mostly by Morgan), I’d opine that one’s ability (or lack thereof) to understand English would have no effect on one’s ability to enjoy this music. “Cádiz” continues with this Latin feel, but here it’s confined mostly to the vocal phrasing and percussion. “I Like It” starts with a toy-piano sound reminiscent of the disc’s opener, and opens out into a swaying melody kept aloft by some nice understated horn charts and effective snare rolls. The net effect calls to mind the sweeping, cinematic, almost Brechtian work of Nina Persson‘s band A Camp. I’m wary of any song that starts with the vapid lyric “feel the beat,” and that’s exactly how “Cinematic” begins. But as I reached for the skip button, the track shifted into something more interesting melody-wise. Then, back to the beat. If nothing else, the track helps to highlight the band’s wide sonic palette; for that it’s worthwhile. “Doggy Song” is something completely different: imagine Shari Lewis (of 1960s “Lambchop” TV puppetry fame) fronting a spare trip-hop ensemble with some spoken/sung, er, doggerel. Now, imagine it somehow being oddly fascinating, and you’ve got this number. It gets better as it unfolds, too, giving more space for the instruments – led by more tasty horn work – to do their thing. Starfruit‘s sole cover, The Dream Academy‘s 1985 hit “Life in a Northern Town” gets reinvented by stephaniesĭd. A spare piano and snare drum-led backing supports Morgan’s fragile, overdubbed harmonies. Keeping the melancholia but substituting subtlety for the original’s anthemic tone, this is a cover that truly adds a new dimension to the song. “Starf***er” – listed by its unexpurgated title in the liner notes/lyrics — is not a cover of the notorious Rolling Stones paean to groupies. It is more or less about the same subject matter – with a title like that, what else could it be – but oddly, the delivery device for this screed is a fetching mod-pop number closer in feel to another underrated Asheville-based band, The Cheeksters. If the lyrics weren’t what they are, this song could be destined for status as the album’s fabled hit single. So it’s a gutsy move (artistically speaking, at least) on the band’s part to engage in this bit of commercial self-sabotage. Things take a turn for the much-weirder from here. Lifting the lyrics from the theme to 70s sitcom Laverne & Shirley, stephaniesĭd applies a spooky, stuttering melody that has no relation to the original. It’s a startling musical left turn, but ultimately a rewarding one. Deeply weird, though: sort of a twisted rethink of “Stairway to Gilligan’s Island” by Little Roger and the Goosebumps, if that’s any sort of a cultural touchstone for ya. “I Like It Too” is just what its title suggests: a variation on the disc’s fourth track. The arrangement differences – particularly the vocals-as-percussion – are inventive enough to make it stand on its own. And while guitar is listed among the instruments appearing on Starfruit, you won’t hear a lot of it in the actual songs. That remains true on the dreamy, plaintive “House of Many Colors,” another song that suggests a worldview that’s equal parts childlike wonder and cracked funhouse mirror. That description certainly applies to the impressionistic lyrical imagery of “Multiply.” A no-cymbals percussion approach and a dripping-with-sorrow-and-regret “string” arrangement makes for a thing of beauty. The guitars finally show up on “So Low / A Hope,” Starfruit‘s closing number. The long instrumental introduction feels like the aural equivalent of a film’s tracking shot, and it’s highly effective. Musically, it’s perhaps the most accessible (I’d never say ordinary) track on the disc, and has the aura of a friendly best-of-luck wave goodbye. It’s a fitting way to end an intriguing album. 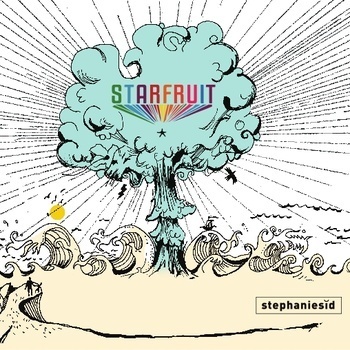 The song — and album — ends as Starfruit began, with a tinkling keyboard melody. Taken as a whole, Starfruit is perhaps a tad too arty for whatever mainstream success is these days. But with this album, stephaniesĭd make a convincing case that they’re a go-to band for those seeking challenging, alluring and unusual music that’s still rooted in pop tradition.